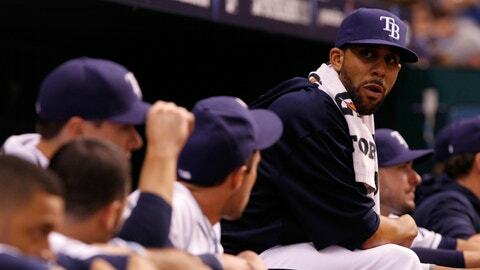 Tampa Bay's left-handed ace David Price is one of baseball's hottest commodities this offseason. LAKE BUENA VISTA, Fla. — MLB’s winter meetings have come and gone. The Tampa Bay Rays fell short of making high-profile moves (trading David Price), but that doesn’t mean a framework for future action wasn’t put in place. Vague by design on Thursday, Andrew Friedman, the Rays’ executive vice president of baseball operations, said the meetings were “very productive on a number of fronts.” By mid-afternoon, there were no new developments regarding Tampa Bay’s first-base situation. But there’s a good chance the Rays will answer the question within the next week. Tampa Bay is likely waiting on James Loney either to return or seek a new home — and a raise — in free agency. If he goes elsewhere, possible targets include free agents Mark Reynolds and Kevin Youkilis. If the Seattle Mariners prepare a pitch for Price, Justin Smoak could be included in the conversations. Oh yes, the Price situation. Though it’s not known for sure, the cost should be mighty high to secure Tampa Bay’s ace. There’s no escaping the fact that any potential deal’s returns will be compared with what the Rays gained in a trade with the Kansas City Royals for James Shields last December. This is the club’s largest offseason need, and it appears Friedman is confident some closure will be reached soon. The Rays would prefer Loney to return — the comfort factor alone would be a reason why — but nobody should fault the eight-year veteran for seeking to receive the best payout he can in the open market. “Just ongoing conversations,” Friedman said, when asked to describe the progress of first-baseman talks. “I think within the next week, I feel very confident that we’ll be able to figure something out. I think the conversations have reached a point where I don’t see them dragging on much longer in that time period. Loney offers a desirable blend of offensive and defensive skill. Expect the Milwaukee Brewers, minus Corey Hart, to pursue him aggressively. Other possible suitors, like the Pittsburgh Pirates, could emerge to raise his price and lure him away. The Rays have revealed little about their top target in this area, but it appears they’re content with their progress. Certainly, Tampa Bay would feel secure in its position if Loney were to return. Even if that’s not the case, expect them to target a strong defensive-first talent at first base to fill Loney’s absence. A left-handed option would be preferred since the Rays are heavy on right-handed hitters, but expect the best defensive option available to slide into this role. What’s left to do: What to do with Price? It’s no shock that the ace left-hander remains the offseason’s hottest commodity. A number of teams have reportedly expressed interest in trading for the 2012 American League Cy Young Award winner: the Mariners, Los Angeles Dodgers, Texas Rangers and Arizona Diamondbacks, among others. As expected, the Rays refused to tip their hand all week about how far possible Price trade talks have advanced. To them, information is power. It would seem logical for the Rays to trade Price sometime before spring training. He’s not scheduled to become a free agent until after the 2015 season, so that means two years of control for a possible winner of the Price Sweepstakes. This week, Friedman said Tampa Bay’s leadership feels no pressure to trade its prized asset as baseball’s hot-stove action heats up around them. See: Robinson Cano to the Seattle Mariners, Mark Trumbo to the Arizona Diamondbacks as part of a three-team trade, etc. The Rays will make this choice on their terms. Will the Rays receive more for Price than what they gained in the Shields/Wil Myers trade last winter? Most throughout baseball think they should, but few possible landing spots for Price have the prospects to make such a blockbuster deal happen. This much is known: The drama’s not over. The Rays won’t rush a decision. Time will tell. Until then, the baseball world will continue to watch, wait and wonder.